Over the past few years I have noticed an increase in the number of anime that are focused on gods or other fantasy beings living in the world of humans and doing normal everyday things. There has been an increased focus on series that merge slice of life with fantasy, and some of them have succeeded more than others. Noragami looked to be along these same lines, as it tells the story of Hiyori, a middle school student who saves a man in a jersey from being hit by a bus only to find out he’s actually a god trying to gain followers. It initially blends comedy and some fantasy action together into a seamless mix, but later reveals itself as a series that is very capable of channeling some very dark moments as well. Hiyori is a fairly typical middle school student, though she does come from a wealthy family that owns a hospital. Early on she encounters Yato, a man wearing a jersey and a scarf. Yato is trying to locate a missing cat as part of a job he’s taken on, and ends up in the middle of the road about to be hit by a bus. Hiyori tries to save him but ends up being hit by the bus herself, and as a result becomes a half phantom. What this means is that her soul can slip out of her body at times and she becomes a ghostlike figure that can see other phantoms as well as god. She also discovers that Yato is actually a god trying to take on odd jobs to gain followers, as he was once a god of calamity but has given up on that and is in danger of fading from existence if people no longer remember him. Initially Noragami seemed like it was poised to be similar to The Devil is a Part-Timer! as it had a balance of flashy battles and comedy. Since Yato caused Hiyori to become a half-phantom she convinces him to try and find a way to fix her condition, causing the two of them to spend a good deal of time together. Yato has lost his regalia, which is a spirit that can transform into a weapon wielded by the gods to fight phantoms. The two of them find him a new regalia, which he names Yukine. With this core cast in place, the three of them become friends of sorts while trying to help Hiyori go back to being a normal human. Quite a bit of the humor early on revolves around Yato’s attempts at taking on odd small jobs to gain followers, Yukine’s embarrassment at being around a girl close to his age, and the fact that Hiyori is not your average female lead. She’s not the usual helpless female in distress type and is actually quite skilled when it comes to fighting, as she has taken influence from a professional fighter she idolizes and isn’t afraid to rush into danger to help either Yato or Yukine. While it has some flashy fight sequences where Yato either has to fight phantoms or other gods and turns Yukine into a sword, these moments are actually the least interesting element of Noragami. The series is at its best when it’s letting the cast’s quirkiness come out or exploring surprisingly dark territory. The cast expands beyond the initial three, introducing viewers to the poverty god Kofuku, god of academics Tenjin, and god of combat Bishamon (to name a few). Each one has their own regalia and personalities, and what Noragami does so well is its ability to bring them to life. Like humans, these gods have their own allegiances and relationships, and there aren’t always clear cut lines between enemies and friends. One great example of this is Yato and Bishamon, who are enemies due to various events that happened in the past. But some of Bishamon’s regalia are friendly towards Yato, and there seems to be more going on beneath the surface. The majority of the gods in the series are also used for comedy at various point, and any scene where Kofuku shows up is guaranteed to be amusing as she brings bad luck with her everywhere she go. But it isn’t all laughs, and when Noragami heads into darker territory it does a complete shift in tone. You see, phantoms are bad creatures and have a tendency to push humans into despair, often making their existing issues worse. They convince those who may have been contemplating suicide or other violent acts to go through with them, and when the series chooses to explore this angle it tackles a lot of the problems facing humans and modern society in the process. There is also a significant emphasis placed on Yukine, as he died during middle school and finds himself longing to still be alive and go through the normal school life experience that most teenagers are able to experience. When the drama takes over Noragami can feel like an entirely different series, and that’s one of the main reasons I like it so much. It’s ability to move between fantasy action sequences, heartfelt drama that’s very easy to relate to, and completely silly comedy that takes into account the quirkier personalities of the cast works to the show’s advantage and made me want to continue coming back to see what happened next. Bones handled the animation production for Noragami, and they did a great job of bringing it to life. Right from the start there’s a very sleek feel to the animation, and it does a great job of portraying both the fantastical gods and regular humans. What I liked the most was how the look and feel of the series was able to shift depending on the tone of a particular scene. During the more serious moments Noragami does away with some of the sillier facial expressions and chibi character models, opting for more realistic portraits that showcase the emotion of the character onscreen. But when the focus shifts back to humor and more lighthearted moments the animation follows suit, returning to the typical anime style that viewers have come to expect. This may not seem like that big of a deal, but in my opinion it gave the series more depth than some of the others out there. As far as music and voice acting goes, there wasn’t much background music that really stood out but the opening and ending themes were both catchy. The intro tune is an in your face rock tune that immediately catches your attention, while the ending theme is a softer piece that hints at the show’s serious side. Voice acting is generally strong, and the actors and actresses are able to transition naturally between sillier quirks and serious drama. You’ll likely notice some familiar voices as well, as Yato is voiced by the same actor who does Izaya from Durarara and Kofuku is voiced by the actress who plays Yui in K-On! I don’t want to spoil too many specific moments, as the events in Noragami are not always predictable and that’s what makes it fun to watch. What initially seemed like it was going to be another “gods/supernatural beings cast in a slice of life anime” turned into an engaging, well-paced show that balanced comedy with a darker examination of some of the issues facing humans in their everyday lives. The depth of relationships between the humans, gods, and their regalia continually drew me in and I was sad when the twelve episodes had come to an end. It’s clear the manga still has much more content to cover when it comes to the backstories of all of these gods and how they all intertwine, and I’m hopeful that Bones might be able to produce a second season at some point in the future. 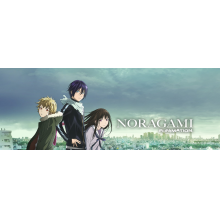 Noragami’s one of the better anime I’ve seen so far in 2014, and anyone that gives it a chance will likely find themselves hooked by at least one of these characters. Nagi-Asu: A Lull in the Sea set for North American release and now streaming on Hulu!